Here is our brand new clothing/fashion/T-Shirt mockup. Perfect for logo presentations, branding projects, packaging, and website designs. Create your own scene in seconds! Whether you’re starting a fashion brand or just enjoy designing clothes, these templates are perfect for you. You can easily edit the item color and use the smart layer to apply your designs. The high-resolution makes it easy to frame specific details with close-ups. Our .PSD mockups are based on professional photos. All objects and shadows are fully separated so you can easily play with them and create your own original custom scene. Present your projects in a way that is visually interesting and attractive to your clients. Save time and make your brand look eye-catching and more professional. Good presentation is half of the success. Present your brand, badge or logo design in a photo-realistic way. You can easily change the label and cord colors to make it your own. Letterhead and business cards mockups work with both US and EU sizes. This pack includes: Label, clip, threads, business cards – 51×89 / 85×55, stamp, needle, small bag, lint roller, socks, bracelet, document A4 / US, scissors, pen, iPhone 6, tag. 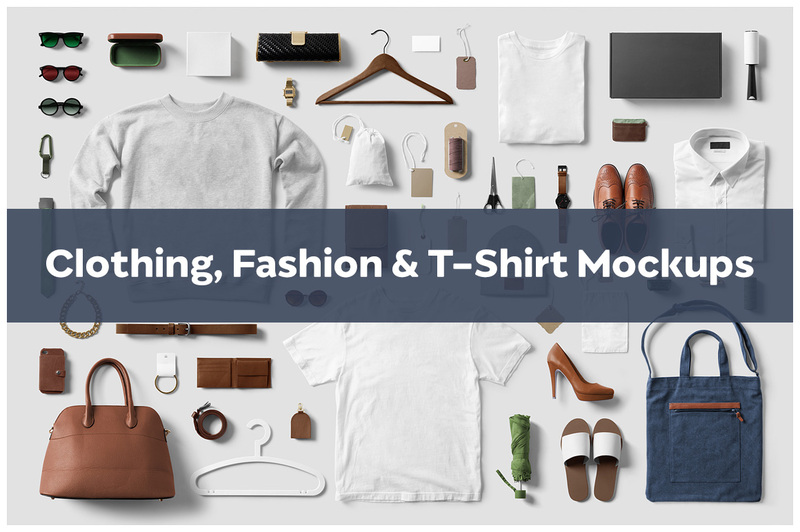 With these T-shirt .PSD mockups you can present your fashion brand easily. This pack includes: T-Shirts, folded T-Shirt, hat, boxes, slippers, sweatshirt, clothes hangers, cap, high heels, tights, bubble envelopes, shoes, tie, shirt suit, open box. These mockups are a great way to show your client what their future clothing brand could look like. This pack includes: Wallets, sunglasses, glasses, glasses case, phone cases, key ring clip, wrist watch, mini bag, necklace, belt, sack, perfume, carabiner, comb, hair bands, rubber band, purse, beanie, umbrella. Save time and make your brand look eye-grabbing and more professional. Good presentation is half of success. This pack includes: Paper bags, plastic bags, jeans bags, mini bag, backpack, straw bag, leather bag. Software compatibility: Photoshop CS2 and newer. File size is approx 1.8GB (3.64GB unzipped), offered as a single download. sorry,download failed,linked to another page, can you solve this problem,thanks. Thanks for your comment, I am so sorry for any inconvenience caused when downloading your resources! Rest assured, I am on the case and have sent you an email to help get you up and running again! I hope it helps, but please don’t hesitate to contact me should you have any other queries. I’m here to help!